Get started with a few complimentary video lessons. When you're ready to begin live one-on-one lessons, inquire here or email me. Enter your email below to find out when new videos are posted and to receive promotional offers. Where should you rest your hand when plucking the strings? Why do so many notes rattle and buzz when playing? How do you play slap bass? These are but a few things you may have wondered about, or perhaps never even considered when trying to learn the bass. Through the lessons we will cover all these and more. The ability to weave a tight, melodic groove over a beat is the essence of bass playing. Whether you have little to no innate sense of time or are have a solid grasp of rhythm, we will actively and regularly work to awaken, enliven, and fulfill your quest for a profound rhythmical experience. The idea of being able to play your favorite songs is likely the very inspiration that brought you to the bass in the first place. 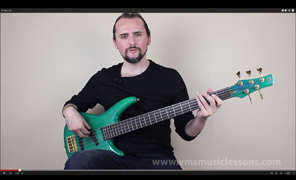 So, after just a few lessons to establish good form, we will start out learning some of the more catchy bass riffs you have come to love before moving on to complete arrangements so you can play along with a song. Inevitably, you will want to create music of your own. When we learn songs, you will also learn what goes into making such music. By learning about musical theory in context, you will then be able to apply this knowledge to your own creative outputs and in the process discover the most fulfilling part of being a musician. More commonly and accurately known as 'scales' and 'arpeggios', certain patterns, groups and arrangements of notes offer a road map to melody and harmony. By learning and becoming proficient with such patterns, you will train your fingers to naturally and spontaneously evoke from the bass the sounds that are the stuff of music. 12 hours notice is required for cancellations to avoid a full charge for the lesson, or loss of payment if the lesson was booked online. Provided a lesson is cancelled more than 12 hours before the lesson is to begin, you can reschedule the lesson to another time if you choose, pick up next week, or apply any online payment to a lesson at a future date. Unlike the typical 24 hours cancellation policy, I find 12 hours to be a time frame that is more considerate to my students, without being unfair to myself. If an online lesson was not forfeited due to a late cancellation, your payment can be returned to you upon request, minus the processing fee (roughly 3%). Copyright © 2013. VMS Music Lessons. All rights reserved. This is a self-designed website.